With a distinguished history of world-changing discoveries and Nobel Prizes, plus the public support that has driven its annual budget beyond half a billion dollars, Berkeley Lab has endured as the Department of Energy’s oldest — and some say greatest — scientific research facility. The Lab’s Creative Services Office has designed a special anniversary logo for use throughout the year on publications, stationery and displays. An anniversary web site will include features and a complete listing of events and activities as they are announced. This year’s annual Summer Lecture Series will be devoted to recollections of days past, some by those who lived it and helped shape the Lab’s legacy. Similarly, a series of “Friends of Science” talks will be promoted for off-site community members to learn more about this unique resource that has been such a mystery to some over the years. Ideas being explored as 75th anniversary events include a Lab “family day,” a “Back to the ‘30s” Founders Day, an anniversary gala dinner, a film festival, and sale of commemorative clothing and gift items. These and other plans will be announced as they develop. It was 75 years ago that a young physicist on the Berkeley campus of the University of California, Ernest Orlando Lawrence, founded a laboratory that would eventually bear his name. For 75 years the Lawrence Berkeley National Laboratory as it is now known, or Berkeley Lab for short, has continued to make scientific history. Ten Nobel Laureates have called Berkeley Lab their home institute. A dozen Berkeley Lab scientists have won the National Medal of Science. Behind these and countless other awards and honors has been a wealth of scientific discoveries and technological breakthroughs that have made enormous contributions to the knowledge-base of humanity. From finding the antiproton, to deciphering the photosynthetic process, to unraveling the mystery behind the extinction of the dinosaurs, the list of accomplishments by Berkeley Lab scientists runs both wide and deep. Equally important, the unique approach to research, in which tough questions are tackled by interdisciplinary teams of scientists, engineers and support staff, which has been the tradition of Lawrence and his laboratory, became the foundation for the modern concept of Big Science. It has often been said that to know where you are going, you must know where you’ve been. 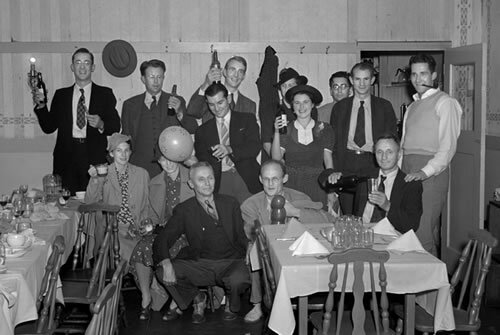 In honor of the 75th anniversary, the Berkeley Lab View will take a look back at our institute’s glorious history. Starting with this issue, we begin a 12-part series that will trace the Laboratory’s evolution from a small physics research group housed inside an old two-story, clapboard-sided, wooden building on the UC Berkeley campus, to a multi-program, multidisciplinary U.S. Department of Energy national laboratory sprawled across 200 acres in the hills overlooking the campus, with an annual budget of nearly half a billion dollars. The old radiation Laboratory on the UC Campus. Historians cite the Roaring Twenties as the decade in which the United States began its transition into a modern technology-based society. For the first time in the nation’s history, a majority of its citizens lived in urban areas. The Golden Age of radio broadcasting began; automobiles, telephones, and electric appliances became staples. The stock market soared and crashed. Prohibition came and went. Suffrage came and stayed. Politicians gave us isolationism, preachers gave us revivalism, and bootleggers brought us organized crime. It was a period of momentous individual achievement and the emergence of new leaders who forever changed the way things had been done. Charles Lindbergh’s solo flight across the Atlantic ushered in the age of modern aviation; Babe Ruth’s home run heroics made baseball the national pastime; and Henry Ford’s assembly lines opened the doors to mass production. In the arts, the literature of Scott Fitzgerald and Ernest Hemingway, the music of George Gershwin, the humor of Charlie Chaplin, and the paintings of Edward Hopper showed the way with their enduring brilliance. And in the arcane world of science, a 27-year-old physics professor in Berkeley began the work that would launch the modern era of multidisciplinary national laboratories. His name was Ernest Orlando Lawrence. 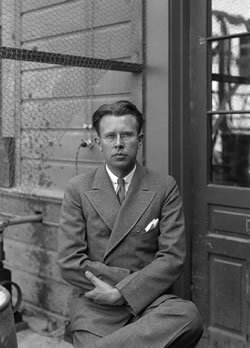 Ernest Lawrence arrived at the University of California’s Berkeley campus in the summer of 1928, having been wooed from a faculty position with Yale University by promises that included auxiliary connections to the chemistry department. Until then, the traditional practice of science was that physicists, chemists, and biologists worked within their own departments and seldom ventured outside their disciplines. Access to scientists and students from other disciplines, as well as to engineering staff, was critical to Lawrence’s success as a researcher. It also set the pattern for the unique laboratory he created. Inspired by a paper from Norwegian engineer Rolf Wideroe, Lawrence, early in 1929, drew up plans for a unique circular particle accelerator, which he referred to as his “proton merry-go-round,” but which would later become known as the cyclotron. It would be another year before Lawrence’s invention was actually made into a device. The first crude cyclotron was constructed in the spring of 1930 by Lawrence and his student, Nels Edlefsen. It was a pie-shaped concoction of glass, sealing wax and bronze. A kitchen chair and a wire-coiled clothes tree were also enlisted to make the device work. Despite its Rube Goldberg appearance, the cyclotron proved Lawrence’s point: whirling particles around to boost their energies, then casting them toward a target like stones from a slingshot could be an efficient and effective way to smash open atomic nuclei. The first working model of a cyclotron came later that fall with the help of another Lawrence student, M. Stanley Livingston. The accelerating chamber of this cyclotron measured 5 inches in diameter and on January 2, 1931, it was successfully used to boost hydrogen ions (protons) to an energy of 80,000 electron volts. Immediately, Lawrence instructed Livingston and another student, David Sloan, to begin construction on an 11-inch cyclotron, a machine that would go on to break the one million electron volt (MeV) barrier. However, even as Livingston and Sloan were starting this project, Lawrence was dreaming of bigger things. In his first year at Berkeley, Lawrence had developed close relationships with two UC Berkeley professors outside of the physics department, chemist Gilbert Lewis and electrical engineer Leonard Fuller. From Lewis he would later get deuterons, the hydrogen isotope in heavy water that proved an invaluable “stone” for smashing atoms. Fuller, who was also vice-president of the Federal Telegraph Company, helped Lawrence obtain an 80-ton magnet that had originally been built to power a transatlantic radio link in World War I but was now surplus. With the gift from Federal Telegraph, and deuterons to use as projectiles, the construction of a cyclotron with an accelerating chamber 27 inches in diameter, capable of reaching energies of nearly 5 MeV, had been made possible. Lawrence, however, would need more laboratory space, one with an exceptionally firm floor. 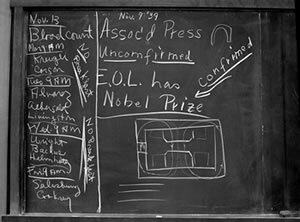 Left: The Lab blackboard announced Lawrence's Nobel Prize. 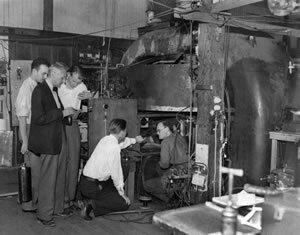 Right: F. Kurie, Donald Cooksey, Edward McMillan, Ernest O. Lawrence, and Robert Thornton encouraging a beam in the 27-inch cyclotron. UC Berkeley had opened Le Conte Hall in 1924 as one of the largest physics buildings in the world. The goal was to build a physics department equal in stature to the University’s celebrated chemistry department. 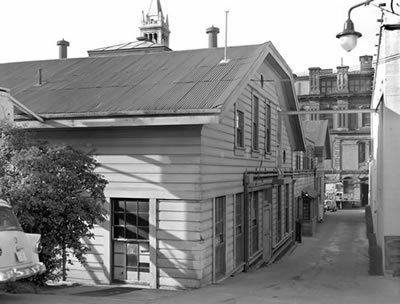 As part of that build-up, Lawrence had been lured away from Yale University and brought to Berkeley in 1928. One of the principals behind Lawrence’s recruitment was Robert Gordon Sproul, secretary to the UC Board of Regents and protégé of master university builder Benjamin Ide Wheeler. Sproul was betting that Lawrence would become one of the nation’s top physicists. He showed his faith in the fall of 1930 when, one day before his formal inauguration as the 11th UC president, he signed off on Lawrence, then 29, becoming the youngest man ever to be named a full professor on the Berkeley faculty. Above: Rad Lab camaraderie found a social outlet at Di Biasi's restaurant in Albany. Back row, left to right, standing: Bob Cornog, Ernest Lawrence, Luis Alvarez, Molly Lawrence, Emilio Segre; second row: Jerry Alvarez (seated), Betty Thornton, Paul Aebersold (standing), Iva Dee Hiatt, Edwin McMillan, Bill Farley; first row: Donald Cooksey, Robert Thornton, and one unidentified celebrant. The 1930s will forever be remembered in this country for the Great Depression, when the land of opportunity became the land of despair. Between 1930 and 1932, nearly half of the nation’s banks failed, Hooverville shanties sprang up across the land to shelter the thousands who’d lost their homes, and the farmlands of the Great Plains were transformed into a “Dust Bowl.” The election of Franklin Roosevelt as president in 1932, with his New Deal programs and Fireside Chats, began turning things around, but the climb back to prosperity would be difficult. Despite the adversity, there were notable triumphs. Two African American athletes, boxer Joe Louis and track star Jesse Owens, lifted the nation’s spirits with their transcendent skills. Will Rogers and Walter Winchell reached millions of radio listeners, the movie Gone with the Wind smashed box office records, the Empire State Building and Mount Rushmore were completed, Richard Byrd explored Antarctica, Frances Perkins became the first woman to serve on a President’s cabinet, and out on the West Coast, the boyish-looking director of UC Berkeley’s Rad Lab assembled a team of scientists and engineers whose accomplishments would become legendary. It took a year to get the 27-inch cyclotron up and running in the Rad Lab, but by September 1932 the machine was accelerating protons to 3.6 million electron volts. The centerpiece of the new Rad Lab would not enjoy its celebrity for long. Lawrence, always eager to advance to the next level, and somehow able to obtain funding despite the scarcity of money, laid plans to expand its accelerating chamber and make other modifications that resulted in a new 37-inch cyclotron, which, by 1937, could accelerate deut-erons to 8 MeV and alpha particles to 16 MeV. This machine was used to create radio-isotopes and the first artificial element, technetium. 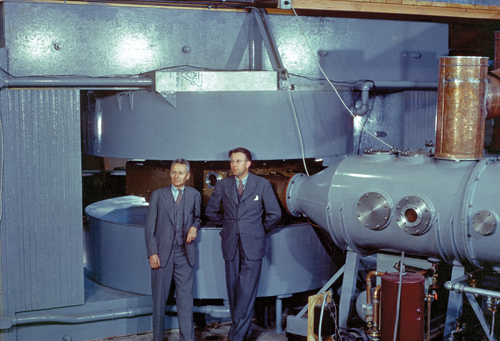 Donald Cooksey and Ernest Lawrence at the 60-inch cyclotron in the Crocker Laboratory. The design, construction, and operation of increasingly larger cyclotrons required an increasingly larger number of physicists, engineers, and chemists. Lawrence’s personal charisma, unbridled enthusiasm and almost uncanny ability to procure financial donations from private sources, enabled him to recruit the best and the brightest. During the decade, the Rad Lab staff grew from five to 60 members. These members included Edwin McMillan, Luis Alvarez, Glenn Seaborg and Emilio Segrè, all of whom would go on to be Nobel laureates, plus other notables, such as Martin Kamen, J.J. Livingood, Philip Abelson, Felix Bloch and the peerless instrument maker Donald Cooksey. One of the most valuable of all his recruits came from Hollywood, mechanical engineer William Brobeck. Lawrence’s scientific recruits proudly called themselves “Lawrence’s boys,” and they were evenly divided between physicists and chemists. Throughout the early years of the Rad Lab, Lawrence was never quite certain as to whether the research there should be called nuclear physics or nuclear chemistry. 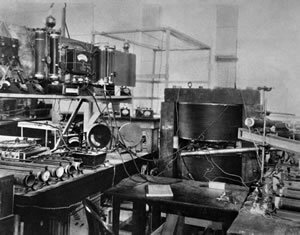 In recognition of this departure from the traditional academic lines of departmental science, the University on July 1, 1936 officially established the Radiation Laboratory as an independent entity within the Physics Department. Henceforth, the new laboratory would be dedicated to pursuits of “nuclear science” rather than physics or chemistry. Lawrence, however, was not content to limit Rad Lab research to just two major disciplines. In 1935, he invited his brother John, a physician, to join the Lab and explore the use of cyclotron-produced radioisotopes in biology and medical research. Other physicians, like Joseph Hamilton and Paul Aebersold, soon followed. 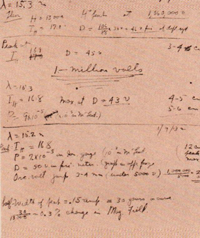 Left: Notebook entry of the first MeV reading: January 8, 1932, 11-inch cyclotron. Right: The 11-inch cyclotron, shown installed in Room 329 Le Conte Hall, the first cyclotron to exceed 1 MeV. The addition of physicians and biologists into the Rad Lab’s scientific mix led to the construction of a second building adjacent to the Rad Lab. Named the Crocker Radiation Laboratory after UC Regent William Crocker who donated the money for its construction, this new facility was designed to house a cyclotron with an accelerating chamber that measured 60 inches in diameter and a magnet that weighed 220 tons. The use of this machine by John Lawrence and his fellow physicians gave rise to modern nuclear medicine. The 60-inch cyclotron began operations in 1939, the year that UC President Sproul’s gamble on Lawrence was fully realized. For his invention of the cyclotron, Lawrence won the 1939 Nobel Prize in Physics. The end of the decade would mark the end of the era of new Lawrence cyclotrons on the UC Berkeley campus. For the next machine he envisioned, a giant more than double the size of the 60-inch cyclotron, Lawrence would have to relocate his laboratory.